5. Security Answer: vapevine (all lowercase, no spaces). *** UPDATE *** >> AUTOMATIC INTERAC DEPOSITS! Take note that you MAY NOT NEED to enter the Security Question or Security Answer as of Jan 1, 2018 as we now have AUTOMATIC DEPOSITS. Your order will be shipped once the funds have cleared in our account. **NOTE** It can 30 minutes or up to 3 hours before we receive email notification from your bank. 3. 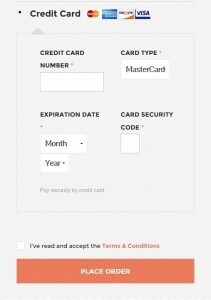 Carefully Type in your Credit Card Number and Choose your Card Type from the dropdown menu (MasterCard, Visa, Discover). 4. Select your Expiration Date and type your 3 Digit CVV Code (often at back of your card). 5. Press the orange Place Order button. What Safety Measures Are Taken By VapeVine.ca? VapeVine.ca prides itself on being a fully secure, site-wide SSL (Secure Socket Layered) ecommerce website. We are also proud to be PCI compliant, offering a safe and stable environment in which customers can do their online shopping. How long does it take for your payment to fully clear and your order to be processed? Waiting for your payment to fully clear. Scanning & shipping your package. This entire process can sometimes take 24 hours or more, so don’t worry if you haven’t received your tracking and/or shipping confirmation email immediately, as you may not get it until a day or so after your payment has been cleared by our bank.